Here we show how to include user-generated modules into ACE. As an example, we introduce Stone (2000) scaling. 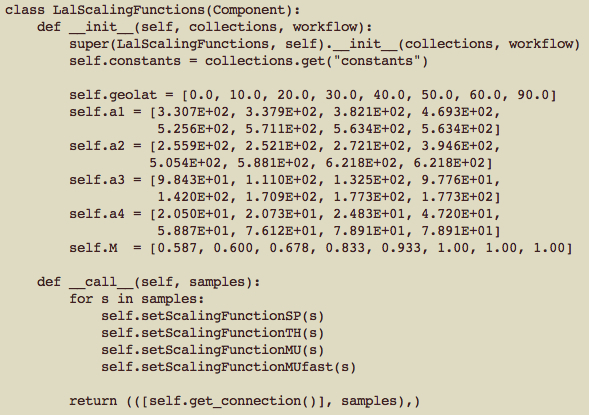 The first line class LalScalingFunctions should be renamed to StoneScalingFunctions, and again on the third line. 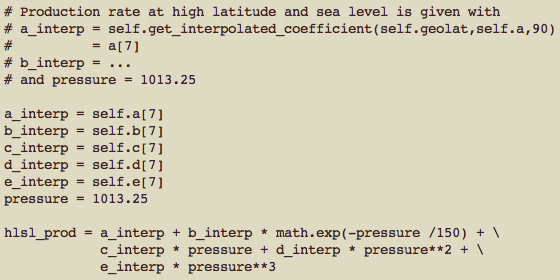 This function finds the latitude of the sample (defined in the code as s[“paleomagnetic latitude”], the attribute “paleomagnetic latitude” of the sample “s”) and interpolates the coefficients a1, a2, a3 and a4 to that paleomagnetic latitude, calling the interpolated coefficents a1_interp, a2_interp, a3_interp and a4_interp. Note that often for Lal scaling the current latitude of the sample is often used. We choose to invoke paleomagnetic latitude as that is used by Lal. As a consequence, the Lal scaling is not time invariant if a time varying geomagnetic latitude reconstruction is chosen. If time invariant Lal scaling is required, “present day” should be selected for geomagnetic latitude during the experiment design phase described in the previous online help section. 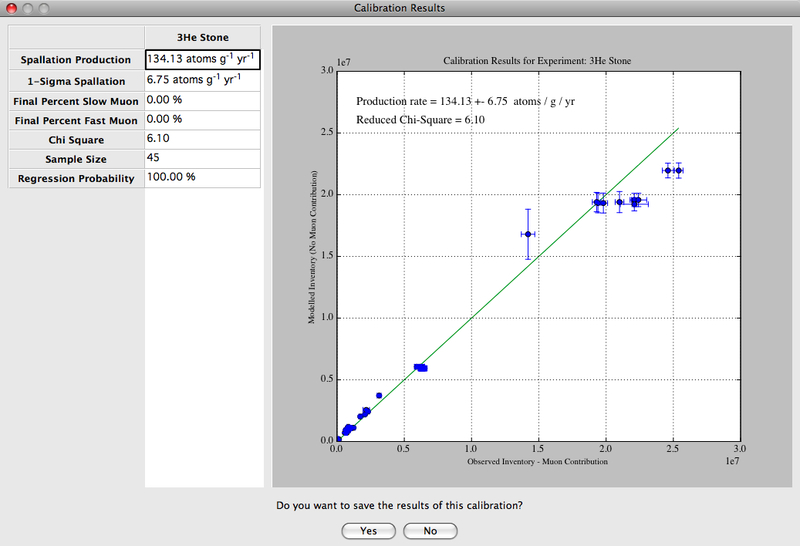 The local spallation production rate is then Equation 1 of Lal (1991). We define it in the code as local_prod. Then the scaling factor will be the local production rate divided by the production rate at high latitude and sea level. In this case elev = 0, so Lal’s polynomial collapses to a1 at 90 degrees, which is a1. Something to be careful about in Python is that in a list (lets call the list a1), the first entry is a1, not a1. So even though a1 above have 8 entries, the last entry is a1. Now we have a spallation scaling factor called s[“S_sp”] which can be passed to any other routine in ACE. 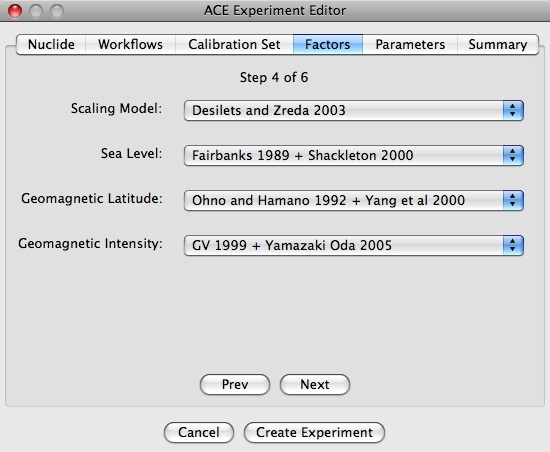 As an example, ACE outputs a variable called ‘scaling spallation’ which adds up s[“S_sp”] at each time step and then divides by the number of time steps to calculate the time averaged spallation scaling factor. So using Stone scaling in a time-stepping formulation on 3He yields a HLSL production rate of 134 ± 7 atoms/g/yr. 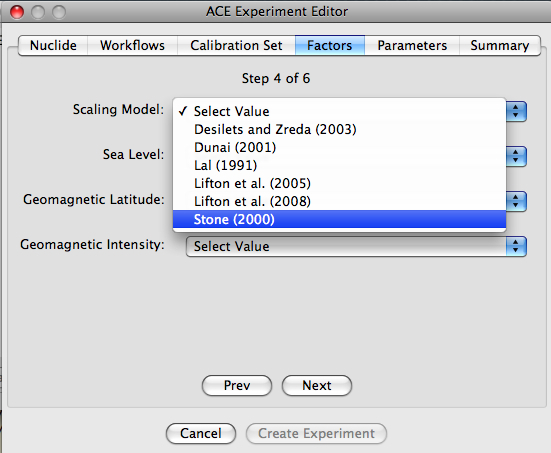 This is a fairly simple example of module additions to ACE, but it should be noted here that changes are automatic in the sense that if Stone scaling is used in an experiment, it will be used both in the calibration and dating routines with appropriate production rates. However if you want to make more fundamental changes to ACE, please email us. The routine used to calculate Stone scaling is available for download: StoneScalingFunctions.py.